If you think reading is a solitary pursuit, you need to go to a book festival. 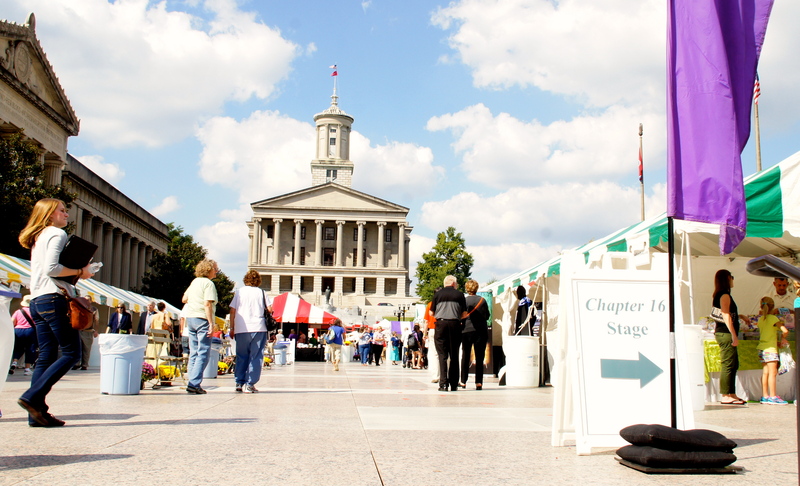 I moseyed down south to the Southern Festival of Books in Nashville a couple of weeks ago and found myself amidst about 30,000 kindred spirits. 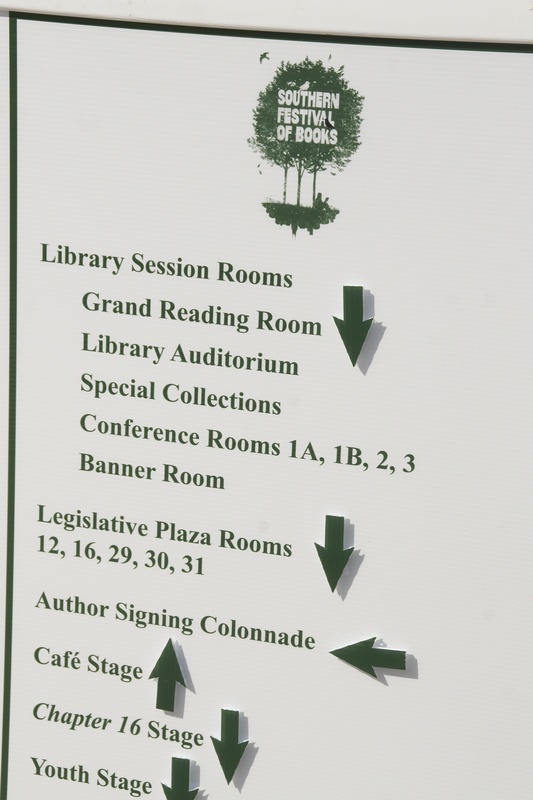 I strolled among rows of tents full of books and publishers–like an art fair for book lovers–set up on the capitol city’s Legislative Plaza. Program in hand, I had the difficult task of choosing among the 212 sessions, three performance stages, and 325 authors speaking and signing their books during the three-day event. So many books and authors, so little time. Legislative Plaza rooms, and in War Memorial Auditorium. Authors talked about their books, like a book club discussion. In fact, book clubs showed up to ask questions and share their enthusiasm for books their groups had read. I especially enjoyed hearing William Landay talk about his experiences as a prosecutor and the ideas that went into writing his bestseller, Defending Jacob. Another of my favorites, Meg Wolitzer, read from her book The Interestings and talked about how her own background influenced the story. But, the fest offers something for lovers of every literary genre, a look at regional writers who you may not know, as well as appearances from big name writers who this year included Bill Bryson, former Vice President Al Gore, Rick Bragg, Roy Blount, Clyde Edgerton, Chuck Palahniuk and others. It was a little slice of heaven for book enthusiasts and the throngs there offered clear proof that, though the publishing industry is changing dramatically, readers are more passionate than ever about books and relish the opportunity to connect with authors and with their fellow readers. I was also impressed with the Festival’s efforts to boost childrens’ interest in literature. It offered sessions for teachers, parents, and young readers from toddlers to YA. Take for example, panels such as “Building Kids Imaginations through Picture Books: Museums, Libraries, Engineers, Mice and More” or “Zombie Tales of the Undead for Teens and Tweens,” or singer Janis Ian reading her book, The Tiny Mouse. In fact, about 60 of the featured authors this year write for children and teens. The biggest event: kids screamed for Rick Riordan (author of the Percy Jackson and the Olympians series) like he was a rock star. Read more about the Festival in Publishers Weekly. A trip to a book festival makes a great trip for a book club, a group of friends, or mother/daughter combos, especially if the festival takes place in exciting destinations such as those next on the calendar of book fairs–the Miami Book Fair International in November, The Tennessee Williams/New Orleans Literary Festival in March, and the Los Angeles Time Festival of Books, in April. With all of the fun things to do in these cities–fun food, night life and beaches, they make terrific destinations, book festivals aside. To plan a trip, check out my book Off The Beaten Page: The Best Trips for Lit Lovers, Book Clubs, and Girls on Getaways. You’ll find essays, reading lists and itineraries for each of these cities. And, check out my other posts on book festivals. 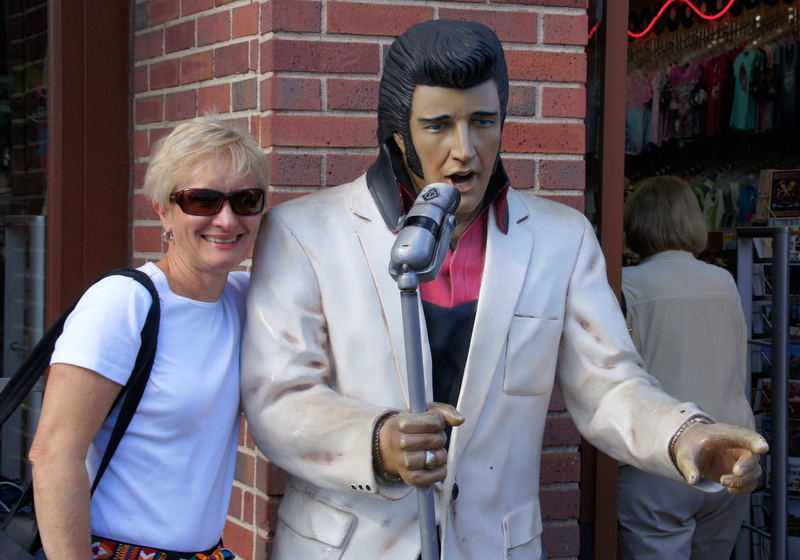 If this sounds a little too book-obsessed, for a weekend in the Country Music Capitol, I want to assure you that we took advantage of the other great stuff to do in Nashville. 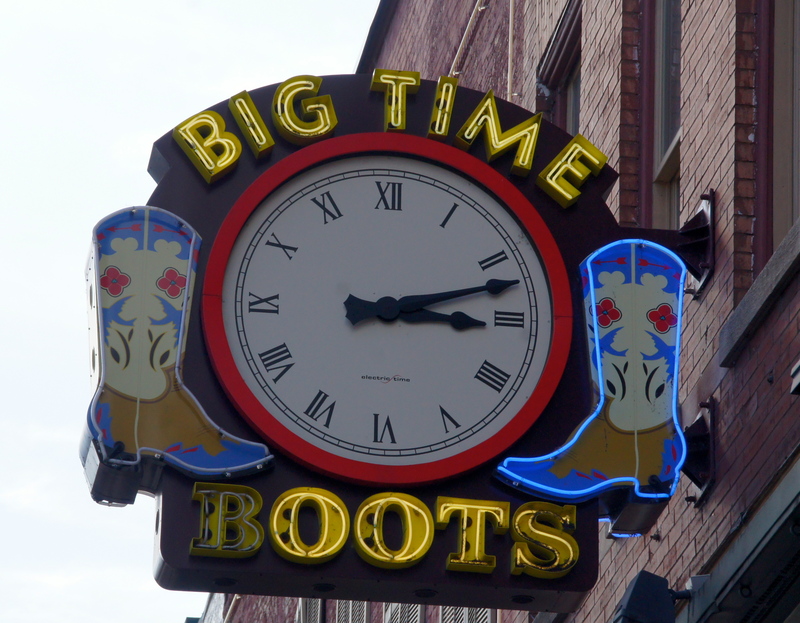 Exhibit A, my new cowboy boots, perfect footwear to wander up and down Broadway, Nashville’s main music thoroughfare, where country tunes pour forth night and day. You never know who you’ll meet on the street in Nashville. (For classic country music, be sure to make a stop at Roberts Western World and Tootsies Orchid Lounge.) Right in the neighborhood, we found good eats at Merchants and The Southern Steak and Oyster. For more Nashville ideas, take a look at this article on GoNomad.